How Does ByPass Oil Filtration Work? A clean engine is more efficient and a more efficient engine gets better fuel mileage and causes less problems which can relate to less repair $$$. Aside from using proper fuel, doing recommended scheduled maintenance (change air filters, coolant, ignition service, et cetera) keeping your engine oil clean is a prime place to help increase engine efficiency; bypass oil filtration will filter out wear contaminants up to 10-15 times smaller than a typical oil filter. What is bypass oil filtration? Bypass oil filtration introduces a high-capacity secondary filter to an engine's lubrication cycle that is designed to eliminate nearly all contaminants in the oil. Though widely known that ultra-fine by-pass filtration reduces engine wear and extends [oil] drain intervals, few know that its continued use can also increase engine efficiency. During normal engine operation tiny airborne dirt and internally-generated metal particles elude even the most efficient full-flow oil filters. Wear particles can reduce fuel efficiency through a variety of scenarios. How does the bypass oil filter system work? The AMSOIL Ea ByPass oil filter works with the engine's full-flow oil filter. The bypass manifold is set to draw off approximately 10% of the oil pump's capacity and then routes that oil through the 2-micron bypass oil filter thus removing extremely small wear particles and contaminants that full-flow oil filters cannot remove. The Ea ByPass oil filter typically filters all of the oil in the engine's lubrication system several times an hour so the engine continously receives analytically clean oil. The bypass oil filter system chosen determines whether the OEM full-flow oil filter remains in use or if both the full-flow and bypass oil filters are relocated to the remote manifold. See vehicle & equipment bypass oil filter kit choices. What is Anti-wear Additive Depletion? Anti-wear additives guard against metal-to-metal contact if a full lubricating film either does not develop or ruptures. These instances may occur at start-up or during periods of heavy load, especially in the contact areas between cam lobes and lifters, and piston rings and cylinder liners. In diesel applications high wear particle levels in the oil can impair the performance of the zinc anti-wear additives. Some industry research suggests that soot and dust particles display polar absorbencies that can "tie-up" anti-wear additives, hindering their ability to control friction, which leads to reduced fuel efficiency. How is Energy Lost to Friction? Under normal engine operation, some of the energy created during the combustion process is lost to friction however; when wear particles breech the clearance between moving parts and rupture the oil film, friction worsens. The problem especially affects the piston ring/cylinder wall contact areas where the oil film can be as thin as three-microns. Wear particles contribute to oil thickening, especially in diesel applications where soot is more prevalent. The thicker oil increases internal fluid heat, which can prematurely degrade oil additives and accelerate oxidation. Particles can agglomerate with soot and sludge to create deposits in the microscopic clearances between valves and guides. Called stiction, the process interferes with the timing of the port openings and closings, causing incomplete combustion and power loss. Stiction can lead to burned valve seats and reduced fuel efficiency. Wear particles can scour away piston liners, cam lobes, piston rings and other engine parts, reducing combustion efficiency and causing the engine to burn more fuel to produce maximum horsepower. Wear in the valve train can disrupt timing and valve movement, while ring, piston and liner wear reduces volumetric compression and contributes to blow-by. Bypass filtration that removes particles smaller than 10 microns directly correlates to reduced engine wear and optimum efficiency. In the article "Clean Oil Reduces Engine Fuel Consumption" on Machinery Lubrication magazine's website, the author surveys a number of studies that confirm this. Studied over 50,000 miles of service, busses fitted with Cummins six-cylinder 8.3 liter turbocharged engines achieved 2 to 3 percent gains in fuel efficiency while operating with six-micron by-pass filtration. A second study of a six-cylinder diesel engine saw dramatic improvements after installing a bypass filter rated at 75 percent efficient at six-microns: oil contamination dropped 98 percent, friction decreased 2.9 percent and fuel economy increased 5 percent. Offering even greater efficiency, AMSOIL Ea ByPass Filters (EaBP) feature synthetic nanofiber media to reduce engine wear and increase engine efficiency. 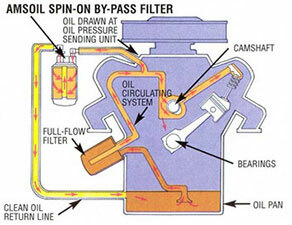 By filtering oil on a "partial-flow" basis, AMSOIL Ea ByPass Oil Filters draw approximately 10 percent of the oil pump's capacity at any one time and trap the extremely small, wear-causing contaminants that full-flow filters can't remove, including 98.7 percent of wear particles two microns and larger (ISO 4548-21). AMSOIL ByPass Filtration Systems have a high pressure differential, causing the oil to flow through the by-pass filter very slowly and allowing for the removal of up to 30 percent of soot contaminants less than one micron (ISO 23556). June 2010 AMSOIL News article "Increased Engine Efficiency With By-Pass Filtration. Noria Corporation's Machinery Lubrication, "Clean Oil Reduces Engine Fuel Consumption" Jim Fitch author. Micron: A micron is an SI (metric) unit of length equaling one-millionth of a meter. A human hair is approximately 70 microns although a hair can range from 40 – 300 microns. The human eye can see particles as small as 25 microns (a speck of dust). Oxidation: Oxidation occurs when oxygen attacks fluids. The process is accelerated by heat, light, metal catalysts, and the presence of water, acids, or solid contaminants. Oxidation leads to increased viscosity and deposit formation (varnish & sludge). In a nutshell, you want to minimize oxidation in your engine oil. Stiction: Jim Fitch at Noria Corporation explains stiction as: When hard particle contamination agglomerates with soot and sludge to form adherent deposits between valves and guides, a tenacious interference, called stiction, results. Blow-by: Blow-by is a situation that occurs during the combustion process in an internal-combustion engine where those sneaky combustion by-products and contaminants slip past the piston rings-to-cylinder liner interface and end up in your crankcase (and your oil). Nanofiber: Generally speaking, a fiber under 1 micron in diameter is a nanofiber (see Micron above). In the context of this article, What is ISO? ISO is the International Organization for Standardization. To borrow a quote from their website www.ISO.org "ISO (International Organization for Standardization) is an independent, non-governmental membership organization and the world's largest developer of voluntary International Standards."